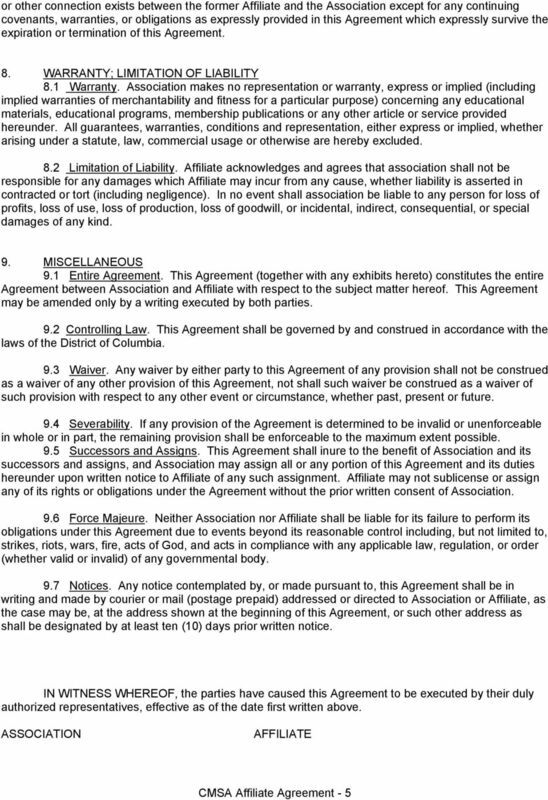 Download "AFFILIATE AGREEMENT. 1.2 Territory. 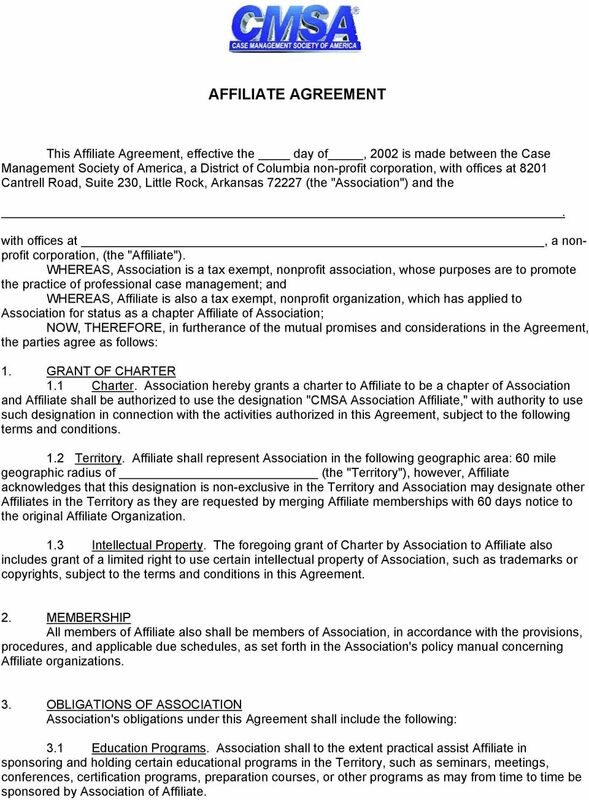 Affiliate shall represent Association in the following geographic area: 60 mile"
1 AFFILIATE AGREEMENT This Affiliate Agreement, effective the day of, 2002 is made between the Case Management Society of America, a District of Columbia non-profit corporation, with offices at 8201 Cantrell Road, Suite 230, Little Rock, Arkansas (the "Association") and the with offices at, a nonprofit corporation, (the "Affiliate"). 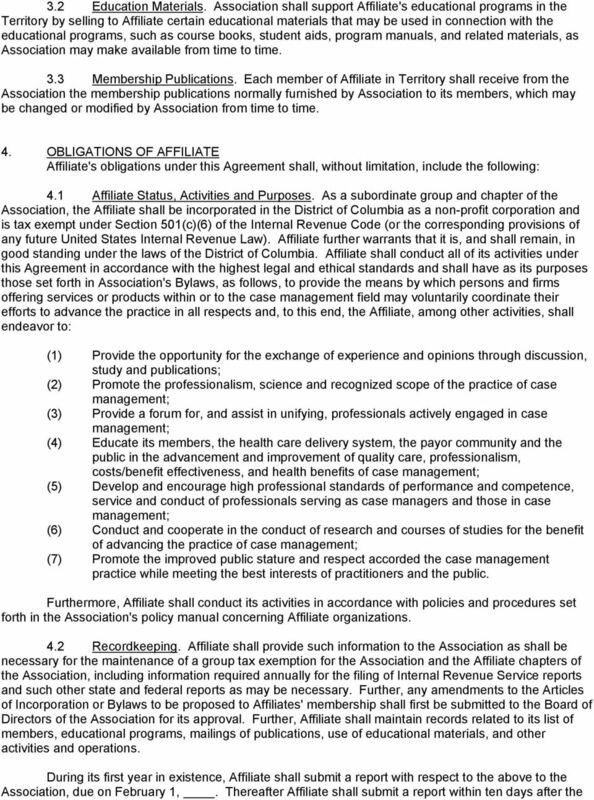 WHEREAS, Association is a tax exempt, nonprofit association, whose purposes are to promote the practice of professional case management; and WHEREAS, Affiliate is also a tax exempt, nonprofit organization, which has applied to Association for status as a chapter Affiliate of Association; NOW, THEREFORE, in furtherance of the mutual promises and considerations in the Agreement, the parties agree as follows: 1. GRANT OF CHARTER 1.1 Charter. Association hereby grants a charter to Affiliate to be a chapter of Association and Affiliate shall be authorized to use the designation "CMSA Association Affiliate," with authority to use such designation in connection with the activities authorized in this Agreement, subject to the following terms and conditions. 1.2 Territory. Affiliate shall represent Association in the following geographic area: 60 mile geographic radius of (the "Territory"), however, Affiliate acknowledges that this designation is non-exclusive in the Territory and Association may designate other Affiliates in the Territory as they are requested by merging Affiliate memberships with 60 days notice to the original Affiliate Organization. 1.3 Intellectual Property. The foregoing grant of Charter by Association to Affiliate also includes grant of a limited right to use certain intellectual property of Association, such as trademarks or copyrights, subject to the terms and conditions in this Agreement.. 2. 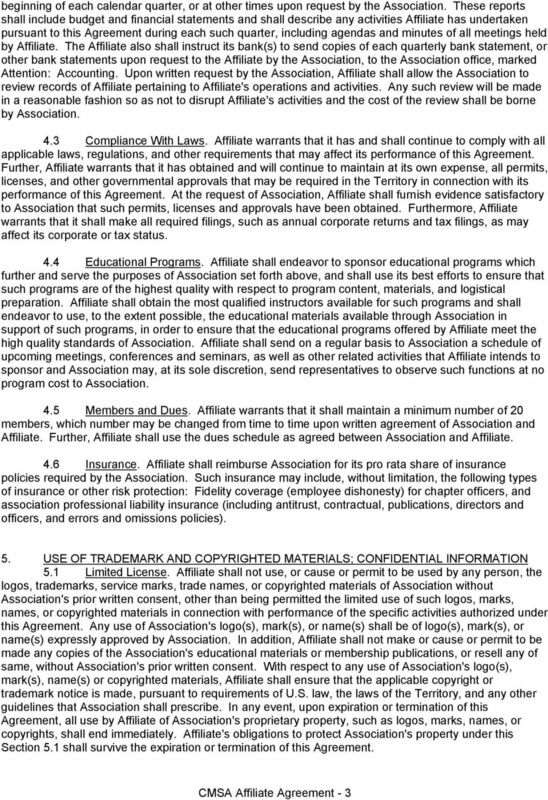 MEMBERSHIP All members of Affiliate also shall be members of Association, in accordance with the provisions, procedures, and applicable due schedules, as set forth in the Association's policy manual concerning Affiliate organizations. 3. 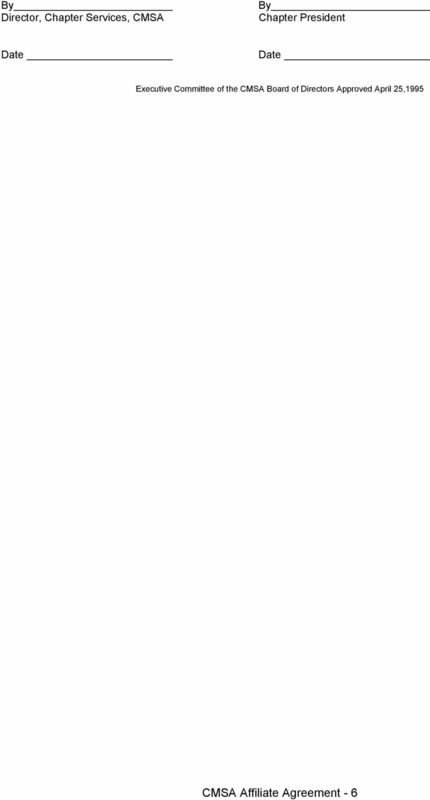 OBLIGATIONS OF ASSOCIATION Association's obligations under this Agreement shall include the following: 3.1 Education Programs. Association shall to the extent practical assist Affiliate in sponsoring and holding certain educational programs in the Territory, such as seminars, meetings, conferences, certification programs, preparation courses, or other programs as may from time to time be sponsored by Association of Affiliate. BOILERPLATE SPONSORED RESEARCH AGREEMENT PLEASE CONTACT LINDA CONCINO, UMASS LOWELL OFFICE OF RESEARCH ADMINISTRATION. EMPLOYMENT AGREEMENT. between HEARTLAND COMMUNITY HEALTH CLINIC. And RECITALS: B. DENTIST desires to provide such services to HCHC.